I love villains. I admit it. As a writer of romantic suspense, my hero and heroine are constantly in danger. But I don't want them being chased by an incompetent cartoon character making stupid mistakes. At the beginning of my story, my villain must be a hair's breadth from winning the battle. Otherwise, the book is over on page one. My favorite part of plotting a new story is digging deep into the villain's psyche and really understanding them. A villain has goals, dreams, and flaws just like the hero and heroine. They are two sides of the same coin, except…the villain's choices put the hero and heroine in jeopardy. Physically, obviously, and in the best books, emotionally as well. In my stories, I usually have a BBG (Big bad guy) who controls some minions to make things interesting. I may even have other bad guys who run around causing trouble. But of course, in my books, unlike real life, all my bad guys get what's coming to them. I relish it when the bad guy has to pay the piper. Like Jafar in Disney's Aladdin. At the end of the movie, our villain realizes that although he won—he gets the "Phenomenal Cosmic Power"—he also has an "itty bitty living space." So, what makes a great villain? Strength of purpose, and the willingness to do or sacrifice anything to get what they want. In other words…the same character traits that make the hero and heroine strong characters (though heroes and heroines don't sacrifice the innocent or each other). Heroes, heroines, villains. So similar. Two sides of a coin. And one thing I learned early on in my writing was that there is a part of me in EVERY character. Even villains. So when it comes to villains…I AM my own villain. A bit disturbing perhaps, but true. The villains in my debut novel, In Her Sights, are driven. Do you have a favorite villain from movies or books? I'd love to hear about them. By the way, I love to hear from readers. Please connect with me. 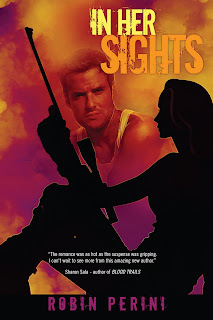 You can get in touch via my website, www.robinperini.com where you can view the In Her Sights book trailer, read excerpts, read reviews, sign up for my mailing list and even request trading cards or a Kindlegraph. I'm also on Twitter, Facebook, and Goodreads. I'd love to hear from you. Jasmine “Jazz” Parker, Jefferson County SWAT's only female sniper, can thread the eye of a needle with a bullet. But she carries a secret from her past that she thought she buried for good at the age of fifteen. Two years ago she even drove away the one man she believed she could love—ex-Army Ranger turned reporter Luke Montgomery—to keep her past hidden. Now, in a fleeting second, the time it takes for one clean shot, one perfect hit, to save the life of the governor's daughter, Jazz's world begins to crumble around her. Luke splashes her face and name across the front page of the newspaper, reawakening her past with a vengeance. A vicious enemy is now bent on destroying her life, forcing Jazz to turn to the one man she can never have in order to stop a killer before she and everyone she cares about pays the ultimate price. 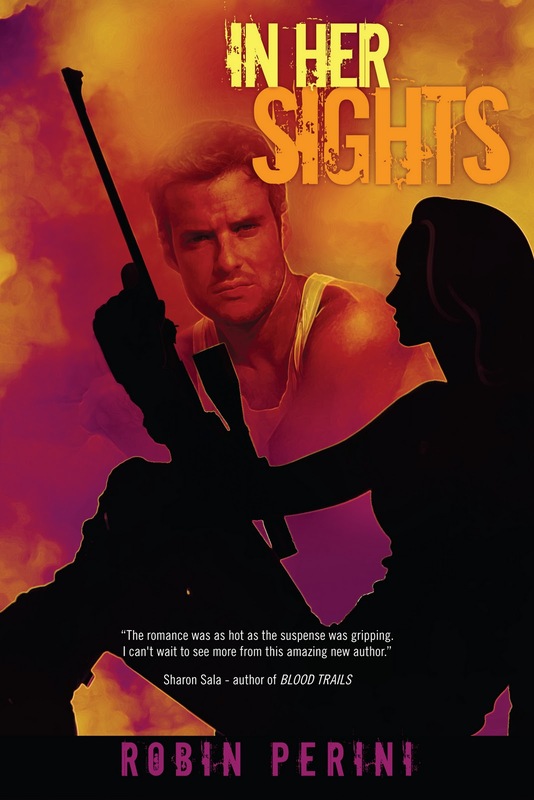 Full of explosive action and almost unbearable suspense, In Her Sights is a relentless, steamy thriller surprisingly infused with soul and poignancy. Award-winning author Robin Perini’s love of heart-stopping suspense and poignant romance, coupled with her adoration of high tech weaponry and covert ops, encouraged her secret inner commando to take on the challenge of writing romantic suspense novels. Her mission's motto: "when danger and romance collide, no heart is safe." As a writer, Robin is devoted to giving her readers fast-paced, high stakes adventures with a love story sure to melt their hearts. 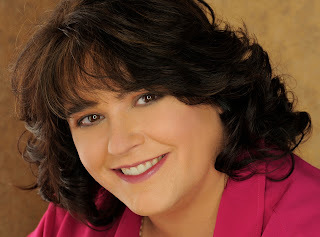 Robin’s strong characters and tightly woven plots have garnered her seven prestigious Romance Writers of America Golden Heart® finals, and Golden Heart Winner in 2011. Stolen Lullaby, will be published by Harlequin Intrigue® in May, 2012 as Finding Her Son. Her other 2011 Golden Heart® Finalist, In Her Sights, will be published by Amazon's Montlake Romance November 29, 2011. By day, she works for an advanced technology corporation, and in her spare time, you might find her giving one of her many nationally acclaimed writing workshops or find her training in competitive small-bore rifle silhouette shooting. She's a voracious reader and a die-hard fan of the T.V. series, BONES. Krystal, thanks for hosting Robin today. By the way, your new blog design looks fantastic! I love the cartoon header. Robin, it's always a treat to hear an author wanting to focus on the villain. Usually so much time is spent building up the hero/heroine that you're right, the villain becomes an afterthought. I admire how invest just as much in creating your big bads as you do in depicting your good guys. Thanks, Krystal, for having me here today. And thanks, Nicole for the comment. I really do get a kick out of villains. The more interesting the better. The In Her Sights villain (no I won't give it away) is one of my favorites because of the motivations behind the actions. I'd love to know if you have a favorite villain? It's always fun to talk about the bad guys! JK Rowling did a great job, didn't she. Her villains are amazing! And of course, there's the fact that we didn't quite know *what* Snape was for the longest time. Love the surprises...when a villain is not what or who you expected...or perhaps the why is interesting or surprising. I'm not usually surprised in movies and books...a downside of studying the craft for so long, but when I am surprised, it's just awesome!